Just tell our cashiers what is your favorite tape; a]. masking b]. duct c]. electrical d]. scotch e]. 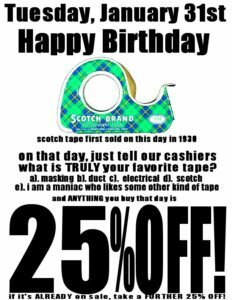 i am a maniac who likes some other kind of tape and receive 25% OFF your entire purchase.